The Compensation practices directive (Directive, 2018-05) may be accessed here. It not only clarifies compensation standards but also provides additional transparency to contractors about the agency’s approach when conducting compensation evaluations. The agency believes this guidance will support the contractor’s ability to conduct meaningful audits internally and eliminate pay discrimination by proactively addressing issues within their compensation practices. 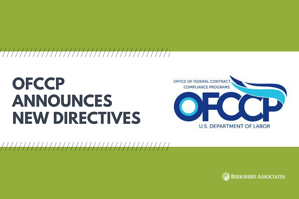 The third directive, Contractor Recognition Programs (Directive, 2018-06) would provide recognition for contractors to help encourage more proactive and robust compliance efforts. The program will also highlight model contractor practices and provide a mentoring program throughout the contractor community to help establishments improve their compliance efforts. A copy of the Directive may be accessed here. More information regarding these Directives will be made available as information is released by the agency. 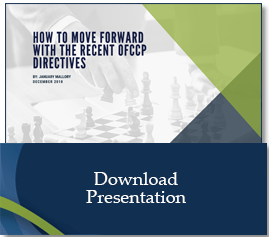 Subscribe to BALANCEview to stay up-to-date on OFCCP directives as they are announced.